1. You don’t need to do this for outdoor plants, only house plants, unlike what the video says. Outdoor plants get water from rain or from the soil. Adding these gels is unnecessary and might pollute if washed away. 2. 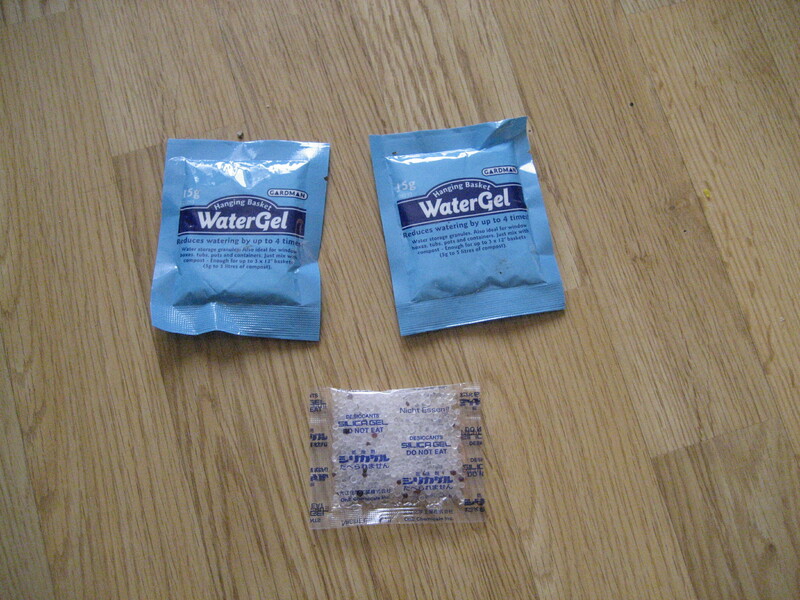 But you don’t really need nappies even- many water supply companies supply such gels for free- I have mine from Thameswater (see the blue packets in the photo). Try and see if your water supply company will send them- all water suppliers are anxious to reduce water waste. I am also trying to re-use the desiccants that you get with food (as in the bottom of the photo below)- will let you know how I get on! 3. Do remember that you will need to have unused nappies lying around to do this- to simply buy nappies to do this is not the way of the canny gardener! Also, do ignore that plug for Volkswagen cars at the end! Categories: compost, gels, houseplants, planting, soil, water supply company, watering plants | Tags: gels, houseplants, nappies, water absoprtion, water supply, watering | Permalink.